A revolutionary new tool for understanding music theory! 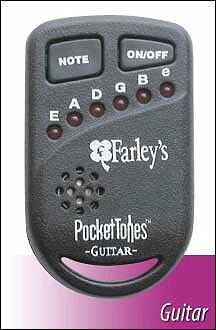 Farley's Musical Essentials presents the Guitar Wheel. A music theory tool designed to help you understand and visualize music theory on the guitar and piano. It is used by teachers as a teaching aid for students, individuals for personal study, or by musicians as a songwriting and composing tool. The Guitar Wheel has two sides which display music theory in a unique way. For guitarists, the Guitar Side helps them see how music theory works, the way they are actually used to thinking about music - on their guitar! Flip it over to the Piano side and you can use it to teach music theory for piano, vocals or any other instrument. The Guitar Wheel is the only music theory tool of its kind so enthusiastically accepted by guitarists, and endorsed by top musicians and teachers. Quick answers. Smart design. 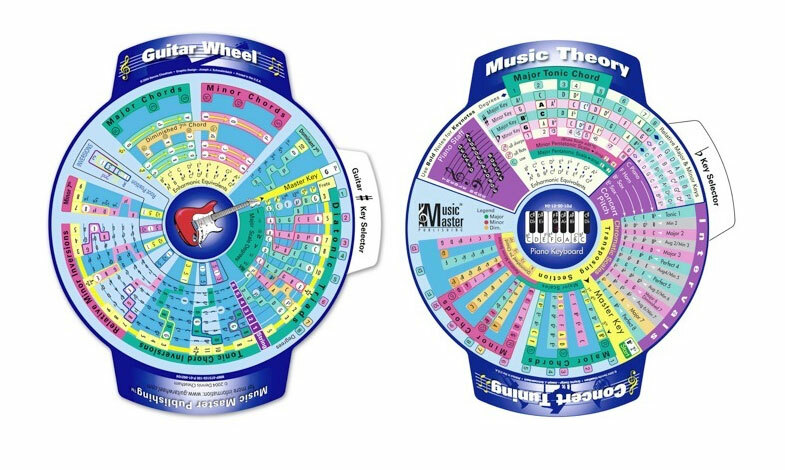 The Guitar Wheel is a 2 ounce reference library of music theory that fits right in your guitar case. It is a simple, easy-to-use, tool that contains volumes of basic and intermediate music theory concepts. Study music theory in any key by turning the tab. Find quick answers to questions or study it to better understand music theory as a whole. The more you look at it, the more will pop out at you and the mysteries of music theory will begin to unravel. Small and made of tough, flat plastic, you won't have to worry about damaging it very easily. • Study music theory in every key! • Music theory for: Major Scales, Minor Scales, Pentatonic Scales, Blues Scales, Degrees, Enharmonic Equivalent, Chord Brackets, Chord Formulas, Dominant 7th Chord, Inversions, Piano Keyboard, Piano Staff, Concert Pitch, Intervals, Transposing, and more! • Shows notes, chords, scales, and much more! • Many helpful references make it the ultimate teaching aid!